A lovely personalised wooden elephant keepsake. A sweet personalised gift that is perfect for celebrating a special christening or as a gift for a newborn. Our personalised wooden elephants make such gorgeous keepsake gifts. Each one is made in our New Forest workshop and will be personalised just for you. These cute wooden elephants are free standing and would look lovely displayed in a child's bedroom. Personalised with your own message they make a lovely gift. Our elephants are made from solid wood. they have a lovely rustic appearance and are hand painted to give a rustic shabby chic finish. We leave the edges of the elephants as plain wood to give a lovely contrast. They are for decoration only and are not intended as a toy. 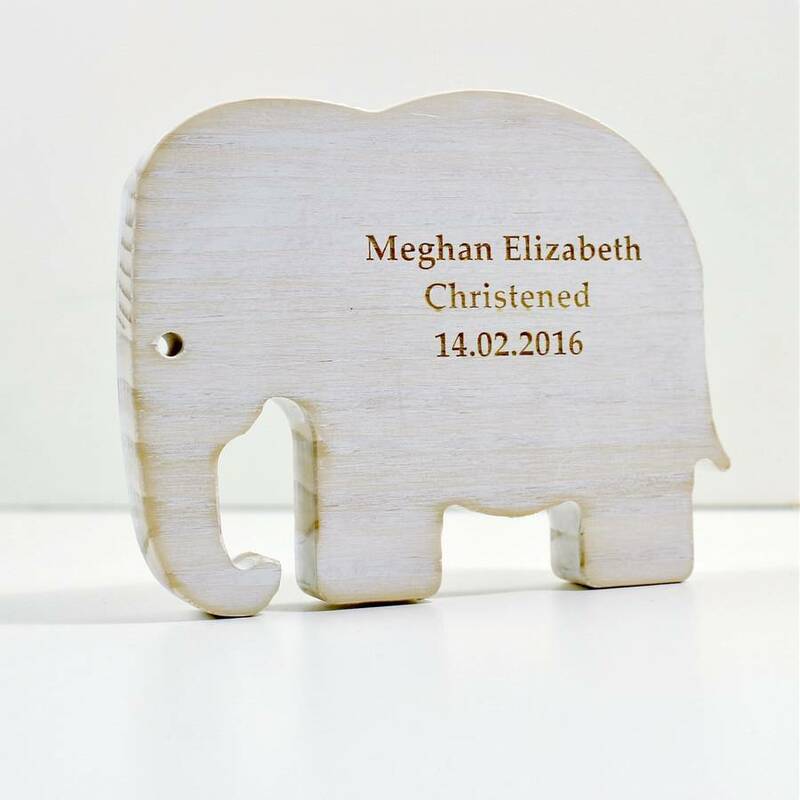 Each wooden elephant keepsake will come with a personalised message laser engraved onto the front, making a truly special keepsake gift. Please note that the message that you enter into the options menu is the exact message that will appear on the front of your wooden star. Each elephant will be completely unique which we think makes them extra special. Personalised wooden elephant keepsakes are made from solid wood and each wooden star will be hand painted. They are approx 2cm thick.